Hong Kong cinema’s glory days may be in the past but, nally, there are signs that perhaps the decline has bottomed out. Earlier this year Trivisa showcased the talents of emerging directors Frank Hui, Jevons Au and Vicky Wong in a slick triad thriller that will have made producer Johnnie To proud. Last December the release of the award-winning Ten Years by another group of rookie directors was strong enough to deny Star Wars: The Force Awakens top spot when it opened at the same time. One more young director looking to make his mark is Chan Chi-fat, winner of the inaugural First Feature Film Initiative organised by the Commerce and Economic Development Bureau. 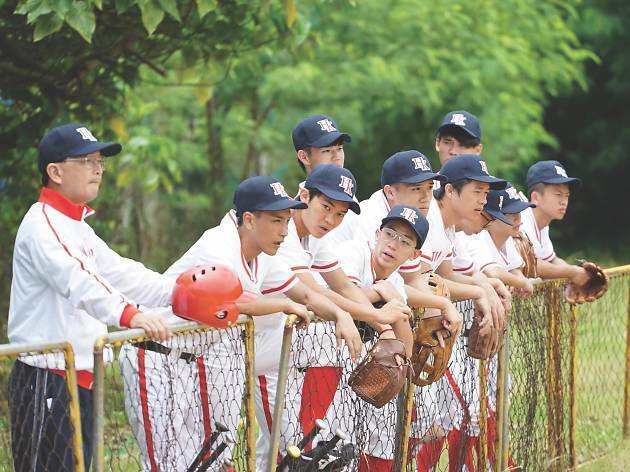 A graduate of Baptist University’s Cinema and Television Programme, the 25-year-old’s debut is a well-made coming of age tale based on the true story of Hong Kong’s first youth baseball team. A former TVB director, Chan tells us what it’s like moving from the bush leagues to the big league. Why did you choose to explore your ideas in a sports and underdog-themed movie? I didn’t intend to use sport as a theme. I always wanted to make a movie about youth and regrets but I couldn’t think of any stories that would relate to the brotherhood of housing estate boys. It wasn’t until I read the history of the Shatin Martins in a newspaper that I realised I could combine the two themes. The background and history of Shatin Martins are what attracted me to explore the sports side of things. I think that helps demonstrate Hong Kong’s nostalgia for the 80s. The movie portrays the 1980s as being Hong Kong’s golden age. Are you optimistic about the city’s future still or pessimistic? Definitely not optimistic, but not pessimistic either. Of course, there have been changes, both good and bad. But no matter what happens, we must persist in our beliefs. Weeds on Fire makes you one of the few successful young directors in the industry right now. How hard has it been for you to get to where you are today? Obviously, I’ve been through a lot of challenges. For example, before I became a director, a lot of people disapproved of my ideas. They said bad things about me and there were times when I would question myself and think of giving up. Even once I became a bit successful, they would give me mocking comments like ‘you won’t be another [director] Adam Wong’ or ‘do you think you’re good enough to be a director?’ People judge you no matter what, so I’ve had to learn to let go of these comments. It’s been very difficult. When times get tough, some people will abandon you and you have to face challenges alone. But still, you have to persist. What are the films from your youth that inspired you to become a director? I enjoyed watching horror movies like A Wicked Ghost. Although, it wasn’t just movies. The music video for Leon Lai’s song All Day Love probably inspired me the most. There wasn’t YouTube or even foreign music videos easily available when I was a kid. And that was the first time I saw a 3D animated MV. I looked at movies and videos as a way to create new things. Do you consider success in the industry as something results-orientated or is it more about networking and relationships? I personally focus a lot on the results. I don’t mind being rude or offending someone as long as I can get the best results. I remember my professor once told me ‘if you want to be a successful director, you can’t afford to be a kind person’. Have you done anything rude in order to achieve the best results? I remember one scene from the movie where I asked the actor to pitch the ball continually. I kept swearing at him. I knew he was in pain but I wouldn’t let him stop. To get the best results, I had to be harsh on the actors. Is there anything in your past that made you into such an indomitable character? I was such a failure when I was in secondary school. Fortunately, I met a person who tutored me and helped me to get into university. He empowered me to work very hard on my studies. After I started working hard, I couldn’t stop. That had a big impact on me. We speak to the local director about his award-winning debut.